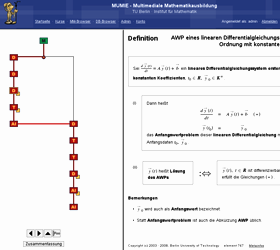 MUMIE is a web-based learning- and teaching environment specialized in mathematics and mathematical sciences. Learning with the MUMIE is active discovering and exploring of concepts, results, methods,algorithms and applications. Our leading principles are: Scientific quality of content, interesting learning environments enhancing cognitive abilities of learners and highest quality of software. Well established pedagogical scenarios like the one by Georg Polya on the heuristic of problem solving and modern concepts of intelligent tutoring are the basis of MUMIE content and learning environments. Individualized problems for each student make MUMIE an ideal platform for teaching math-courses in particular for STEM students. The acronym MUMIE stands for teaching mathematics to engineers supported by multimedia. The same content constituents, like a definition or a theorem, can be used in courses, worksheets or stand alone. Problems can be personalized by random numbers or random choice from a pool of problems. Thus, each student has his or her own problem to solve. Both the system itself and the authoring tools have modern and self-explanatory user interfaces. Content is context-free. It can be modified and arranged in many different ways into courses,worksheets or stand alone. Lots of interactive applets for visualizing and explore complex mathematical concepts. For users no special skills are needed. Developing interactive visualizations requires modest programming skills. Works for large courses (thousands of students) as well as for individual self-training. Integrated tool to write, preview and test content and to upload it to a MUMIE server. MUMIE has stongly improved the success rate of students in mathematics and computer science. Pre-defined roles for students, lecturers, tutors and authors with specific permissions and utilities. Most content is available in several languages. Developing multi-lingual content is easy. Users and developers from 5 different countries and well known universities contribute to MUMIE. Courses can be structured as semantic nets, trees or flat lists, each with several levels of navigation. End user only needs a modern web browser. We like to help in any question of net-based education, based on many decades of teaching experience and software development. If you are interested in our authoring tool MIAU and would like to test it, please contact us via our contact form here. We will provide you an access to MIAU.